CIBC has announced its expansion of the smartphone transactions for credit card holders. Major Canadian bank, CIBC, has now partnered with a second large wireless carrier in the country in order to be able to broaden the availability of its mobile payments services to its customers who have NFC technology enabled smartphones. CIBC and Telus have now announced a new partnership and mobile payments app. This partnership has brought about a new app that will allow certain models of smartphones with NFC technology that run on the Telus network to be able to be used for making credit card purchases for items costing up to $50. These small purchase include anything from groceries to gas. 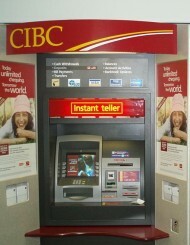 CIBC already has an established partnership with Rogers for NFC technology based smartphone payments. In order to encourage mobile payments to spread more broadly, smartphones would have to be enabled with near field communication tech. This makes it possible for the terminals to read the necessary verification data from the mobile devices so that small credit card purchases can be made. At the moment, to use this service, the credit card must have been issued by CIBC and they must have their wireless service through Rogers or Telus. In the future, the bank expects that a partnership may also be possible with Bell, one of the largest wireless providers in the country. The more wireless carriers there are in partnership with CIBC for NFC technology based mobile payments, the better the chances that a credit card customer will be able to actually use these services.